1597569615 –A Guide to School Services in Speech-Language Pathology, Third Edition serves as an introductory overview for the college student who is ready to embark on his or her school-based student teaching experience, and thus is ideal for instructors of methods courses preparing practicum students for school-based experiences. Not only is it an excellent text for novices to the field, but also a very useful resource for the practicing, school-based speech-language pathologist. 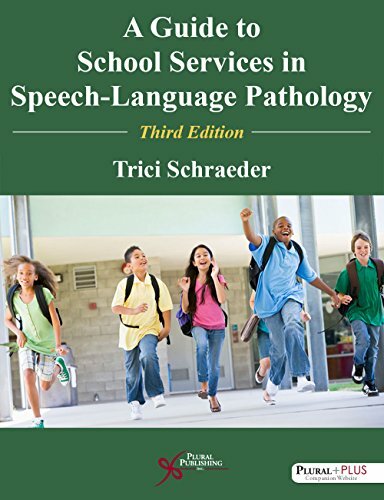 Beginning with history related to school-based speech-language pathology services including a discussion of legal mandates (e.g., the Individuals with Disabilities Education Improvement Act, No Child Left Behind Act, Every Student Succeeds Act, and the Americans with Disabilities Act) the text then delves into a description of service delivery models, an introduction to the concept of a workload analysis approach to caseload standards in schools and example implementation strategies, a display of concrete, real-life, success stories, and an offering of strategies for using evidence-based practice, proactive behavior management, conflict resolution, professional collaboration, conferencing and counseling skills, cultural competencies, goal writing, informal assessment procedures, and creating testing accommodations. A new chapter provides the evidence base for links between language, literacy, and the achievement of school standards. This chapter is a must-read for every school speech-language pathologist. Real-life scenarios based on experiences shared by public school speech-language pathologists give the reader concrete examples upon which to scaffold the complex professional concepts. Chapter summaries provide an overview of the major points presented. Questions at the end of each chapter are designed to engage the reader in analysis and comprehension of material, and vocabulary related to each chapter is conveniently defined at the start of each chapter so that the reader can better grasp the subject matter within.